The following hotels have block bookings ('Accommodation for SABM Conference'). When making your booking with these establishments, please specify that you are attending the Southern African Base Metals Conference (SABM) organised by the Southern African Institute of Mining and Metallurgy (SAIMM). Note that N$ 1 = R 1. 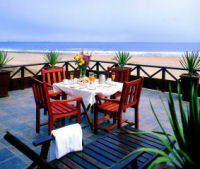 This is certainly Namibia's premier coastal holiday resort. This 4-star luxury hotel has been built around the impeccably restored "Bahnhof" (old train station building) where the old ticket sales area has been transformed into the reception and hotel lobby. Colonial in style, the hotel is set around a large quad with immaculate lawns, a sparkling swimming pool and lofty palm trees. Enjoy the luxury of one of 90 en suite rooms, most of which overlook the pool. Seven TV channels, mini bar and fridge, baby-sitting service and 24 hr room service are available. The Station Grill and the Platform One Restaurant offer mouth-watering menus. Attached to the hotel is the lively entertainment centre with its rustic pub, casino, gym and conference facilities for up to 300 delegates. 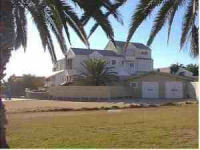 Is situated in the heart of Swakopmund and offers you charming accommodation with en-suite bathrooms. Only 20 seconds away from the beach and jetty, this pension has 24-hour security. It has a warm friendly atmosphere and a sumptuous breakfast awaits you in the morning. Is a stately home converted into a guesthouse with 6 en-suite bedrooms, breakfast and bar facilities, lounge, sun deck and expansive gardens. Recently renovated, this house is equipped with all the modern conveniences and offers in-house guests the use of fee wireless Internet that is accessible 24/7. Guests can enjoy full English or Continental breakfast at the house, or dine from a super selection of nearby restaurants to suite every taste. If a personalized service is what you enjoy, then Guest House Indongo is your place to stay in Namibia. Deutsches Haus is conveniently situated only a few minutes away from the town centre. Comfortable guest rooms all have en-suite facilities including self-dial telephones. Guests can relax in the attractive recreation area, supporting a solar-heated indoor swimming pool and sauna or alternatively at the private bar. Situated on the edge of the picturesque Walvis Bay lagoon, the Pelican bay Hotel consists of 47 Twin bedded en suite rooms (24 Non smoking), a presidential suite, a junior suite and a room designed specially for the disabled, each room has a stunning lagoon view and you can watch the birds or dolphins frolic in the lagoon from the privacy of you own balcony. Each room has the facilities the discerning traveller might require including satellite television, direct dial telephone, tea and coffee facilities in room, individually controlled air conditioning, infra red heating lamps in the bathrooms and room services. Nestled amidst this ethereal beauty, on the edge of the largest sand dunes in the world, overlooking the mighty expanse of the Atlantic Ocean in between Swakopmund and Walvis Airport is the Burning Shore Beach Lodge. A modern, luxurious establishment, this ocean-side lodge is located on Long Beach just south of the unique quaint town of Swakopmund. It offers 7 Luxury Rooms and 5 Luxury Suites, all enjoying private bathroom facilities. This establishment is very central situated and in about 4 minutes you can walk into the city centre and 500 meters to the beach. All rooms are equipped with shower/bath, toilet, a mini kitchen, telephone, cooling fan & heater. Beer, wine and non-alcoholic beverages can be obtained from our self-help bar facilities or served in the tranquil atmosphere of our lush garden. The hotel has 14 individually decorated bedrooms en-suite each containing telephone, TV (satellite), hairdryer and under floor heating - the luxury rooms have a fridge and a safe . Enjoy the indoor swimming-pool and the sauna. Relax on the roof terrace with a beautiful view over the ocean and the dunes. For your sun-downer there is a small bar for house guests. Various good restaurants are close by. 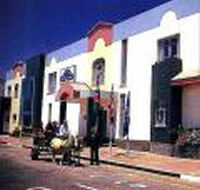 You will find the gracious historical building built during German colonial times in the heart of Swakopmund. Accommodation comprises two family flats, 14 double rooms with en-suite facilities and 5 single rooms. All rooms are equipped with telephones and a fridge and there is a TV in the comfortable lounge. Full or Half-Pension is possible. The Walvis Bay Protea Lodge offers a memorable haven for travellers from near and far. All rooms are en-suite, with air-conditioning and 10 DSTV channels including CNN/M-NET, ergo dynamically designed working desks as well Internet access. Breakfast can be enjoyed in the gracious breakfast room or in the relaxed garden setting. Provides eight well-proportioned, tastefully furnished rooms and self-contained apartments with lovely single rooms and larger apartments for bigger groups. 4 Channel TV and fans in all the rooms, telephone and internet facility. To complete your well relaxed stay, be served with an English breakfast with a touch of mystic overlooking the tranquil garden and water features. When making your booking with these establishments, please specify that you are attending the Southern African Base Metals Conference (SABM) organised by the Southern African Institute of Mining and Metallurgy (SAIMM). Note that N$ 1 = R 1.